Even dinosaurs need to upgrade their computers once in a while. When I started my business in 1991, I chose to buy the most powerful, yet affordable desktop computer possible. Shopping around the local computer stores I settled on a gleaming Intel 486 equipped with a 17” color monitor. It’s almost embarrassing to remember that the price tag was nearly $4,000 back then, but this Dino was ready to work on CAD with the best of them. Every 4 years or so, hardware technology growth justified an upgrade. Along with the hardware, now and then I also updated my software, that is until I chose to stick with AutoCAD Release 14 for an extended period. In hindsight, that may not have been one of my more astute decisions. 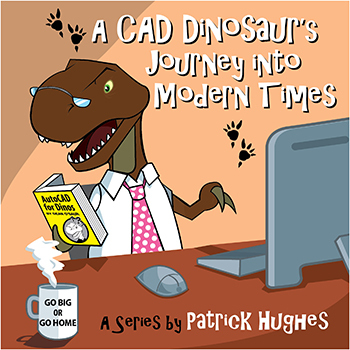 But now with AutoCAD 2015 running at my claw tips on a powerful workstation awarded to me for winning the Cadalyst video contest, this T-Rex is getting all he could wish for. Powered by an Intel Xeon six-core processor and 32 GB of memory, this workhorse has not left me wanting. Coupled with a 3 GB NVIDIA Quadro K4000, I added a second 23” monitor (which is how I keep my many AutoCAD tool palettes and windows open). I haven't had any performance issues to speak of. The only sound this machine makes is a pleasing whoosh of the fan on start up. The rest of the day this old Dino can concentrate on my design work without any computer noise in the background. In the right-hand screenshot below you'll see the Autodesk SEEK Design Center, a new tool I now enjoy. Design Center has been around awhile and you are probably familiar with it. I find it not only useful to insert content from my parts library, but I can also insert blocks from other drawings without opening them. A right-click on a block in a drawing gives you options to insert and redefine the blocks, open in the block editor, or create a Tool Palette. Once created, you can drag and drop additional blocks into the palette. Rawrrr! AutoCAD's SEEK Design Center (right) offers tools that let you import objects and more into a current drawing block. Blocks are not the only objects that you can easily import from existing drawings, there is a whole slew of items ranging from Textstyles to Layouts, Layers, or Dimstyles to name a few. I mostly use it for blocks because my text styles are already set in my templates. In an earlier article I mentioned the calculator that you also see in the screen capture. I find it especially useful to avoid errors in numeric entry from calculations. I’m a bit of a stickler for precision and often carry out decimals to 6 digits. The calculator lets me easily paste the calculated value after making the calculation. Any errant keystroke when dyslexia strikes is no longer a worry, well, as long as I don’t enter things wrong in the calculator. You might also notice the status bar includes a bit of custom diesel code displaying a few items that I long ago decided were valuable. I appreciate that AutoCAD has kept so much of its legacy programmability. But, with that, you can also see that I'm still not using some of the newer tools such as dynamic input and other aids. I keep experimenting with new ones, but many times my old Dino ways seem to get the better of me. In closing, I doubt this constant progression of more powerful computing will end. There are times when you must update and when you do, you should reach for the stars and equip yourself with something that will not just do an adequate job now but will handle future demands as well. How about that? Here's an old dinosaur offering up advice about planning for the future — what has this world come to?